Figure 10 Renal sinus replacement lipomatosis with renal stones. Unenhanced CT scan reveals calculi in the renal pelvis with associated renal parenchymal loss, increased amount of renal sinus fat, and renal sinus fat stranding. Abbreviation: CT, computed tomography. Figure 11 Bilateral xanthogranulomatous pyelonephritis. (A) Unenhanced CT scan demonstrates large branching calculi in the renal pelvis bilaterally. 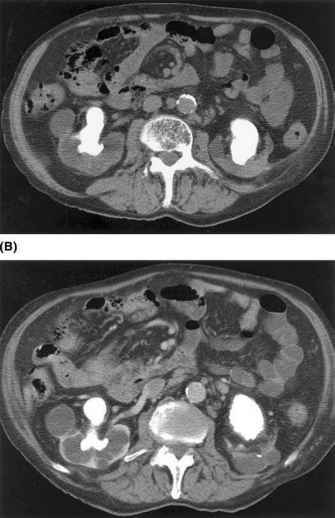 (B) Enhanced CT scan demonstrates hydronephrotic-appearing areas of decreased attenuation in the renal parenchyma. Abbreviation: CT, computed tomography. approaching that of a standard six-film EU examination. However, performing multiple CT acquisition series, such as precontrast and postcontrast, or rescanning with thinner collimation considerably increases the patient dose. More recently, automatic tube current modulation techniques on MDCT scanners have been shown to maintain acceptable image quality regardless of patient attenuation characteristics while substantially reducing patient radiation exposure (61). Figure 12 Unenhanced CT scan obtained through the pelvis reveals a stone (arrow) in the distal left ureter. Note a fetus (F) in the gravid uterus. Abbreviation: CT, computed tomography. third trimester, usually pass without intervention and are the most common nonob-stetric cause for a pregnant patient's hospitalization. Although most patients can be managed clinically without imaging, in those patients with prolonged pain or the development of infectious complications, imaging may become necessary (62). Serial examinations with US, including transvaginal imaging, often are not diagnostic for stone disease. Rather than perform a "limited urogram,'' we have switched to CT (Fig. 12) in this setting based on the lower radiation dose to the fetus calculated by our physicists compared to the serial films required for a urogram (63). The ability of CT to detect nonurinary tract diseases in this setting is an important clinical consideration. The utilization of MR imaging is also evolving in this setting of pregnancy. The vast majority of renal and ureteral calculi can be detected on unenhanced CT. To some degree the visibility relates to stone size and composition (64). Stones that are not visible on KUB but visible on CT include small stones and plain film-radiolucent stones, such as uric acid stone, xanthine, triamterene (65), ephedrine, and guifenesin (66). Rarely encountered small matrix stones (67) and stones composed of excreted protease-inhibitor drugs (namely indinavir, nelfinavir, and sulfadiazine) for the treatment of HIV-infected patients (68) are not opaque on unenhanced CT and appear as filling defects in the renal collecting system on excretory phase-enhanced CT scans. In a series by Bani Hani et al., CT showed an egg-shaped mass with a thin outer rim of calcification surrounding a soft-tissue density center in three of five patients with matrix stones (69). attenuation value measurements of stones in vitro (71-73) and in vivo (74-77). Most of the in vivo studies were able to differentiate uric acid stone from at least one other stone type. In a recent in vitro study by Zarse et al., high-resolution MDCT yielded no overlapping range in attenuation value of various stones including uric acid stones (566-632 HU), struvite (862-944 HU), calcium oxalate (1416-1938 HU), and hydroxyapatitie (2150-2461 HU) (73). CT is now well established as the primary radiological examination in the detection of urinary tract stone disease. Several potential applications of CT technology hold promise for further increasing the clinical value of CT in stone evaluation. An accurate CT-based method of defining overall stone volume would be helpful both in determining the choice of stone therapy and in assessing the results of that therapy. 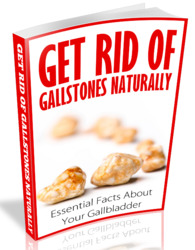 This would be particularly advantageous in those patients with medically treatable stones such as those composed of cystine or uric acid. A simple CT software program to provide accurate stone composition analysis from CT scans would offer similar clinical benefits. The development of sophisticated techniques utilizing measurement of coherent scatter data from X-ray diffraction studies may facilitate this composition analysis (78). Continued reduction in radiation exposure from diagnostic CT is a progressive application needed in all aspects of imaging.